Enjoy healthy and convenient foods in just minutes. The NuWave is different because it uses safe infrared technology to cook food faster and thoroughly without generating the high heat that triggers an unhealthy result. The NuWave Oven Pro requires no fats or oils for cooking poultry, meats, pork, and more, making it the ultimate all-purpose oven for anyone wanting to prepare healthy, delicious meals. 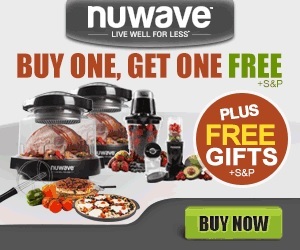 You can cook many foods in the nuwave oven. Cook hamburgers, hot dogs chicken, casseroles, fish, steak,pork chops. The foods you can cook are endless. You can cook right from frozen. This is a must have kitchen countertop appliance. The NuWave Oven, the ONLY countertop infrared oven to win the ChefsBest Award. NuWave has been honored as the Best Performing by independent professional chefs for seven years in a row since 2000. The NuWave is proud to be endorsed by the Cooking Club of America with over half a million members and recommended by Health and Wellness Club with over 225,000 members.